Giovanni Kessler, head of the European Anti-Fraud Office (OLAF), has gone from accuser to accused. In a phone interview with Mark Micallef he speaks of his agency’s actions,which led to John Dalli’s resignation as European Commissioner. A leaked summary of the supervisory committee opinion paper on the John Dalli affair states you overstepped your remit, that you conducted investigative actions you do not have the power to conduct in this case. You have seen this report, can you confirm it? Contrary to what was written in the press, the supervisory committee never said we acted illegally or did some illegal acts. In some points of their opinion, they raised some issues and recommended we deepen the legal aspect of some issues. They never wrote the words ‘illegal’ or ‘illegality’ in respect to our investigation. If you read what the supervisory committee said in its annual review report (which is public) with respect to fundamental human rights, they only say positive things and they say that OLAF has improved over the past years. They only say there have been some shortcomings due to the old procedures that we changed on February 1, 2012. In connection to the John Dalli affair? In annexe 3, there is a box which makes indirect reference to the Dalli case (without naming it). There they draw some lessons from the investigation but not by saying that we have done something illegal. They claim that we have not done sufficient legal reflection, for instance, and ask for the OLAF regulation to be amended. What about the other unpublished opinion? Even in this, they never say that we have something illegal. In the most critical part, they express concern that OLAF has not seemingly done sufficient legal analysis on a particular point and recommend that we should do such an analysis on two aspects. I would also like to underline that this is not really their job. It is even dangerous if the supervisory committee starts checking the legality of our investigations. They dispute this. The supervisory committee chairman said specifically at a recent hearing in the European Parliament that the committee feels this is entirely within its remit. Well, they can do what they want, and in fact they do, but the point is that it is for the European Court of Justice to decide such matters. The last time we lost a case was in 2008. So the point is that they can do an analysis but it is not for them to judge on a point of illegality. Let’s go to the first interview with Gayle Kimberley in Portugal. Did you really tell her to fear John Dalli and Silvio Zammit when you first met her in Portugal? I don’t really know what she said so I don’t really want to judge her. She said this in court. I understand. I absolutely deny it, strongly. The interview in Portugal was a very normal interview, which was very accurate. The text was reviewed by her and she eventually asked for some corrections and they have been granted. She said that you got very flustered and nervous when she asked for corrections. No, absolutely not. She asked and got the corrections she wanted. There is nothing wrong with this. Did you really take her out for lunch, and had wine? Wasn’t this inappropriate? There was no wine and this has been clarified, but I would like to say that I don’t really want to go into these matters. I understand you are doing your job but you have to appreciate that I cannot be getting into a situation where I am answering to the accusations of a person involved. That’s up to the judicial process in Malta. In the press conference you gave in Brussels right after Mr Dalli’s resignation, you said you investigated the possibility of industry entrapment. How did you do this, because there is no sign of it in the report? I said we considered this possibility and you have seen our conclusions. We basically checked and double-checked the story given to us and also uncovered new information via other sources. But there is no mention in the report of the process you went through to verify the entrapment angle. This was a reasoning we made on the basis of the evaluation of the facts. We checked the information and added further information so it was not only based on the complaint. So your point is that this process of looking into this possibility was done during the fact-checking process? Exactly. The point of an investigation is to know what has happened, full stop. Without the initial information, there would have been no investigation, of course, but that was only the starting point. Then we went on to evaluate how genuine the information was. In the process, we uncovered further information, such as the fact that Gayle Kimberley was not at a meeting [with John Dalli and Silvio Zammit] on February 10 [contrary to what she had told Swedish Match]. 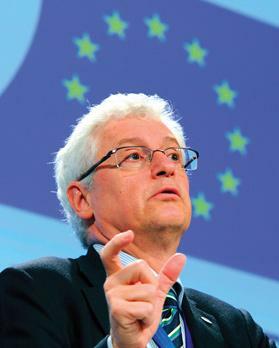 About the February 19 meeting, Green MEP José Bové had an interview with Swedish Match official Johan Gabrielsson, in which he said that the tobacco company was told by OLAF to stick to their version of the facts – that Dr Kimberley was at the February 10 meeting – despite having learnt from the agency that this was not the case. Did you really instruct them? Absolutely not, we do not instruct anyone to do anything. This was clarified by Swedish Match already. Moreover, if Mr Gabrielsson repeats the version of the facts as he knows it, this is not lying, from a witness point of view. If Mr Gabrielsson tells a different version to what he has always known, based on what he has learnt from the press, OLAF or the courts in Malta, that is a different matter. But we instructed nobody on what to say. What would you say is your hardest piece of circumstantial evidence against Mr Dalli? I cannot really answer these sorts of questions. You have to appreciate my position. These matters have to be discussed in the courts, we cannot do a trial in the press or in the Parliament. What we need now is for the evidence to be discussed in the judicial procedure. I’ll take you back to what appear to be contradictions in the report’s conclusions. The report states, for instance, that handwritten notes written by Silvio Zammit on a paper with bullet-point questions about snus [with words like ‘France’ and ‘say no to ban’] “logically originate from someone possessing inside knowledge”. What makes you say this, since these are really vague notes? Again, I don’t feel I can discuss such matters while the judicial process is ongoing. The ultimate conclusions have to be made by the judges. But the conclusion may not be made by judges on Mr Dalli because the case may never go to court. You had said it is likely there is no criminal case against him. It’s up to the Maltese authorities to decide. We are not a prosecution office but investigators who collect the evidence, plus there was also an investigation by the Maltese police. Was there any point during the investigation in which the European Commission or the industry pressured OLAF in any particular direction? Absolutely not, we have not received or felt any kind of pressure or intervention from the outside. Was there any interaction with the Maltese government beyond the official interaction of the Internal and Audit Investigation Department, or would it refer to the Anti-Fraud Coordination Service? We did not have any contact in any way with any Maltese authority, apart from AFCOS. At a certain point we asked for the assistance of the AFCOS head, Rita Schembri, whom we knew as a member of the OLAF supervisory committee. We involved them when we needed to do something in Malta, mainly the interviews we carried out with Silvio Zammit and Gayle Kimberley. By the way, someone recently drew my attention to an allegation that Ms Schembri was involved in drafting the report. Absolutely not. They gave their assistance in the investigative activities that we had in Malta.